Of course, not everybody cares as much about Yankees fans suffering as this Mets fan. 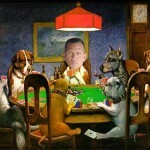 From baseball to auto racing to golf to football to poker, there was a little something for everyone in the world of sports. CHEERS for the Giants and the Phillies, playing a playoff preview series in San Francisco. The Giants took the finale after the Phillies won the first two, including a fight-filled first game Friday night. BOOS to Jimmy Rollins for stealing second base with a six-run lead in the 6th inning, precipitating Shane Victorino getting plunked by Ramon Ramirez. 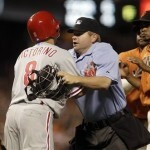 Did Shane Victorino charge the wrong guy ? 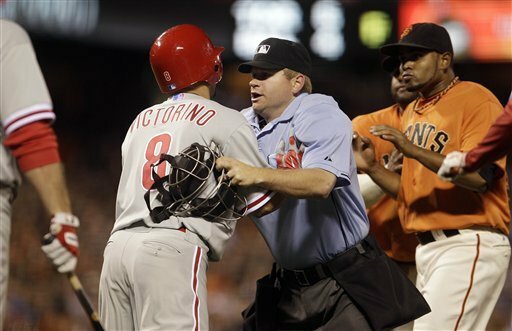 LOUD BOOS to Victorino for starting to walk toward the mound instead of charging it after getting hit, allowing the umpire to get in his way, then later escaping his teammates’ grasp so he could randomly attack somebody from behind, which turned out to be 44-year-old SF hitting coach Hensley Meulens. Victorino should’ve charged Rollins instead of Ramirez anyway. CHEERS for Brad Keselowski for winning the NASCAR race at Pocono Raceway despite having broken his ankle earlier in the week. CHEERS for Adam Scott for winning the WGC-Bridgestone Invitational, holding off World #1 Luke Donald and young stars Rickie Fowler, Jason Day, Ryo Ishikawa and Rory McIlroy. BOOS to caddie Steve Williams, who helped guide Scott to the victory, but afterward made it all about himself. No doubt still upset about the way Tiger dumped him, Williams proclaimed the week was the best of his caddying life and said he never had a bigger win in his 33 years on the bag. Apparently the 13 majors, including the Tiger Slam, weren’t as important as this event. RIGHT!!! BOOS to ESPN, which consistently scrolled in their updates only the words Ryan spoke before that, which were, “There’s no way I’m going to wish him well. There’s no chance of that,” allowing viewers like myself to infer Ryan might want physical harm to come to Ellis. A-Rod hasn't played (Baseball) in a month, but still making headlines. 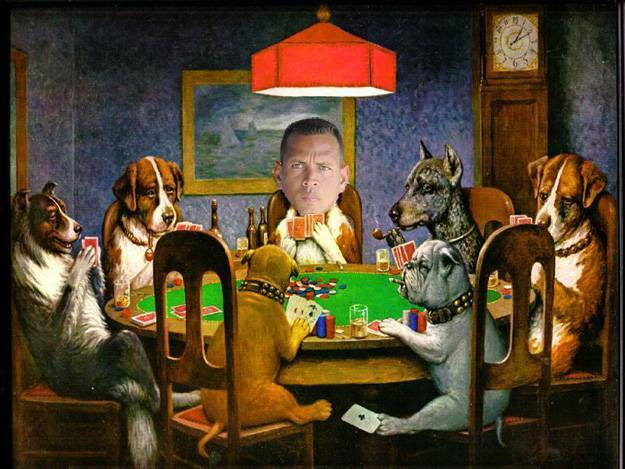 BOOS to MLB for making a potential investigation of A-Rod playing poker a news story. When baseball and other sports refuse to allow Vegas to handle bets on their games (which of course won’t happen because betting increases viewership) then they can act holier than thou. BOOS to a Buckeyes’ staffer for selling wristbands with the initials JT on them in support of former coach and liar, Jim Tressel. For an institution of higher learning, the people at Ohio State aren’t too bright. CHEERS for the start of college football, now less than four weeks away. This entry was posted in auto racing, college football, golf, Jake Stevens Six-Pack, MLB, NFL and tagged baseball, buckeyes, college football, espn, jim tressel, jimmy rollins, mlb, nascar, nfl, ny jets, ohio state, red sox, rex ryan, steve williams, tiger woods, victorino, yankees. Bookmark the permalink.